I hate the first week of school. It fills me with anxiety and dread. I once loved the smell of new crayons and was excited over the new backpacks and folders. Now I worry. I parent children from hard places; children who have experienced trauma. I’ve been lucky the last two years. I had a teacher that “got it”. I had a teacher that listened to me and studied up on trauma and it’s effects on the child’s brain. She understood that unaddressed trauma generates lifelong impacts that can end in early death. Parenting my child is life or death and I decided to write this post to explain. I was once a 3rd grade teacher, so I know that you might be thinking this is all a bit dramatic. However, I am now the mother of 7 and I live with the effects of childhood trauma every day. These are the things that I understand as a mother, a former educator and a nurse. Trauma impacts the children in your classroom. We have sanitized trauma in our lives. Opioid crisis. Food insecurity. Sirens and fights in the night. We don’t really think about the smallest victims. We don’t read about the child hiding in the backroom during a drug bust, or the baby left in an apartment tended by his 11 year old sibling with only ramen and cereal to eat. Instead we protect anonymity to the detriment of these children who end up in the classroom struggling with a story that is never told. We end up treating the traumatized by ignoring the trauma. If you are a teacher, you WILL teach children who have been traumatized. The CDC ACE study tells us that more than 50% of students in the classroom have experienced one or more adverse childhood events (ACE). The time in life when the brain is the most sensitive to experience is infancy and childhood. Studies show chronic stress or unaddressed ACEs can change the chemical and physical structures of the brain. In the classroom, children can display traumatic stress through aggression, anxiety, defiance, perfectionism, and withdrawal. And here’s the biggie, signs of trauma often times look very similar to ADD, ADHD, ODD and autism spectrum disorder. Think on this…inattentive, hyperactive, and impulsive behavior may in fact mirror the effects of trauma or adversity. Children show their emotions through behavior. What might seem like random, nonsensical or manipulative behaviors in a child, might actually be rooted in a space called ‘FEAR’ and pain. The emotional backpack they carry to school each day is one that they cannot set outside your classroom door, and it will remain heavy and forefront in their brain. It’s important to understand that 25% to 50% of the students within your classroom, will be affected by adverse childhood events. Trauma undermines attention, executive functioning and working memory. When trauma causes emotional or psychological damage to children, they may adopt a set of behaviors or patterns of thinking that put them on a path for further trauma. Trauma begets trauma. 1. Set the TONE – you need to use the environment to regulate the brain. Your students who have experienced trauma in their lives are often operating from a primal state – always ready to fight or flee. They have learned that the world is not a safe place. They are living in a state of hypervigilance; their little minds have been hijacked by their basic instincts and impulses which renders them unable to concentrate. Your classroom environment and schedule is your greatest weapon. Clear expectations and schedules are everything. You can create a safe environment that actually helps regulate the brain. Think schedules and procedures. If a child can anticipate routine, they can feel safe. 2. Recognize that a child is going into survival mode. When survival mode occurs, you are not going to be able to talk and correct the child. You need to provide a safe space and help them regulate. This might mean sinking down to eye level and saying, “You are safe.” and then simply step away for a while. The cure for trauma is a safe relationship and you are going to give the child space and environment to feel safe. School is not easy for my children and every year I walk in praying they have a teacher that ‘gets it’. A teacher that can see how self-regulation doesn’t exist with a child from trauma. Yes, it sounds crazy, but this is important. Regulatory skills live in the highest part of the brain. Dysregulation lives in the lower parts of the brain. 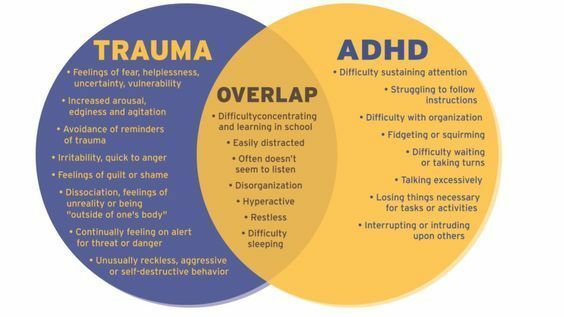 Trauma in a child’s life causes children to live in the lower part of the brain and this means dysregulation, and this looks like a child who is either hypervigilant or disassociated. As a former teacher, I would have described this as the ADD child or the daydreamer. I would have used stickers, rewards, and consequences to curb this behavior…and it never worked. What works isn’t teaching self-regulation. It’s giving children experiences of co-regulation over and over and over again. Until their brains literally take in and imprint the regulated adult. Children from trauma or from hard places, cannot self-regulate because they were never given the experience of co-regulation. They need YOU. Yes, you may be the only co-regulating adult in their life. My children need you to have a teacher relationship with them, not an attachment. Attachment is the bond that develops between a primary caregiver, usually the mother, and her infant. This attachment ensures survival for the infant. My child should not attach to you as the means to survive. However, they should have a relationship with you as a ‘secure base’ within the school system. My child needs you to navigate the world of school, and to point to me for attachment. This relationship you have, will help you teach to my child’s emotional age and not chronological. It seeks to understand how history can cause learned helplessness and behaviors that you do not understand. I share the picture below. I began talking about how our children often present with behaviors that look like the shark, but if we look below the water, we will realize they are really just scared goldfish trying to have a need met. Their behaviors might communicate anger and hostility, but below the surface is fear and a hurting child. I further explained that it is our job as parents/teachers to stop parenting the shark fin, and look below the surface and meet the needs of the goldfish. Repetition is important because with every positive experience the impact on the brain grows. Traumatized children expect the worst and focus on the negative. If you understand this, you will be better prepared for it. Childhood neglect is the most damaging trauma. The child must not have basic needs threatened in any way or survival will be all they think about. At the point the child was abused, the brain was focused on survival not learning. The development the child missed due to abuse will need extra attention. Traumatized children will often score lower on IQ tests than their true ability. Retest when their environment is helping them heal and watch the scores go up. The goal in healing trauma is when the child becomes agitated to help them learn skills to reduce the agitation. This repeated cycle is what most helps the child. Promote play with traumatized children. Play is very healing to the brain and the emotions.